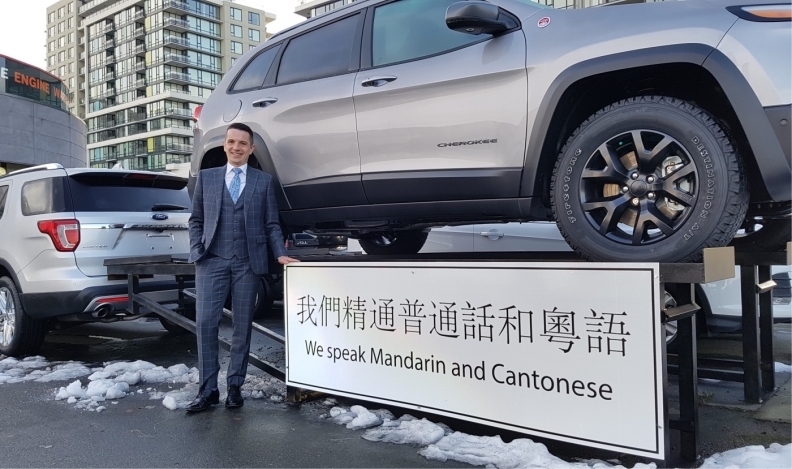 Justin Gebara, GM at Columbia Chrysler-Dodge-Jeep near Vancouver, said Chinese buyers appreciate service, respect and a good price, as well as sales staff who speak their language. VANCOUVER — Canada’s WestCoast metropolis, long a prime destination for Chinese immigrants, is attracting new wave of prosperous transplants who spend freely, but want exemplary service from dealers. The latest immigrant wave is probably the most prosperous, adding a group that’s “likely to be conspicuous consumers,” according to one analyst. Most do not fit the stereotype of cash-rich entrepreneurs, but they and other Chinese Canadians constitute an important automotive market. Meeting their needs requires more than patronizing tokenism. Dealers have to deliver on service and the quality of the deal, says Justin Gebara, general manager of Columbia Chrysler-Dodge-Jeep. The store is in suburban Richmond, where about half the 200,000 residents are of Chinese origin. Many arrived in the last two decades. Yes, Columbia marks Chinese New Year, and Gebara ensures he has local Mandarin and Cantonese speakers on staff. But Chinese customers are looking for great service, honest dealing and the best price possible, just like any other buyer, he said. “The importance of Chinese consumers cannot be neglected by car manufacturers or dealers, as they represent a highly lucrative prospect for acquisition,” Cheung wrote in an email. Purchasing goods such as luxury automobiles indicate social status and economic power, Cheung explained. “With more tenured immigrants, the adoption to Canadian values of practicality [and] functionality are typically more prominent, hence though a luxury car still has appeal, it’s not as essential for a tenured Chinese,” she said. For well-heeled immigrants, price might not drive the buying decision, added Chunhua Wu, assistant professor of marketing and behavioural science at the University of British Columbia’s Sauder School of Business. “For them, it’s more about the service levels instead of the price promotions or incentives,” he said in an interview. Recent arrivals gravitate toward brands they knew in China and, said Cheung, luxury and brand reputation are important attributes. Foreign luxury vehicles carry high import duties in China, making them comparative bargains in Canada. Gebara said language is rarely a barrier at his dealership, but Wu said many recent investor class immigrants aren’t comfortable speaking English with sales people. Cheung added it’s useful to have staff who mirror the market’s demographic, including language, cultural background and shared experiences. The popularity of German luxury brands among wealthier arrivals to Vancouver also has a downside, Wu said. Strong demand coupled with lim ited availability might prompt sales people to lie so a customer won’t shop around. “If they don’t have the inventory, they tell you that there’s nothing in Vancouver and you need to wait for two months, which turns out not to be true,” said Wu, himself a recent car shopper. That kind of manipulation creates bad word-of-mouth, he said. Cheung said immigrants also tend to be more tech-savvy than “mainstream” consumers using the web and mobile apps to stay in touch with people back home. Many dealers use social media to reach out to potential customers, but Wu said public platforms such as Twitter and Facebook are not as popular among Chinese. They prefer WeChat, a Chinese developed messaging app that has nearly one billion users in the country and abroad. A sales person who wants to stay in touch with potential customers should notify them they have a WeChat account, he said.